"I flowered the plant that was given out by Ken Woods as unidentified at the BSA meeting in December 2008. Here are a couple of the images of one of the plants. Both plant have the same features and the same flowers but I have been unable to correctly identify the plant or the cross. I assume that T. schiedeana is one of the parents. I sent the images to Ken Woods and Ken reported that he had thought that it was a seed raised plant from Pam Koide of the species T. occulta that he had photographed and posted on the BSA website as occulta, but on checking the description on the disc it should have purple flowers if it is, so it is anybodies guess as to its identity. Can anybody help? "Interesting. I am with you. If you get a bicoloured flower like this you think that T. schiedeana is involved. 'Scurfy' could well be involved too. Have a look at http://botu07.bio.uu.nl/bcg/bcr/index.php While you are there go to advanced search and enter schiedeana as seed parent. Look at the photos of each entry to get the feel of the effect of schiedeana. Now enter schiedeana as pollen parent. Do the same. You will see that W.Timm crops up a lot. He is my Cuzen Bill from Florida who is one of the few Floridians keen on Tills. He picks up on a lot of supposed natural hybrids and unregistered names. These plants could well have also been imported to OZ before Bill named them. However, I tend to think that the Aussie woes are linked to the 'Tooshie' 'Scurfy' etc phenomenon. Let us know your thoughts after investigations! Remember we are often working in the dark ( By the way that is a rough translation of occulta!) because so many growers/hybridists do not worry about recording achievements or names." Ken Woods, 11/05. Terence Davis, 11/10. 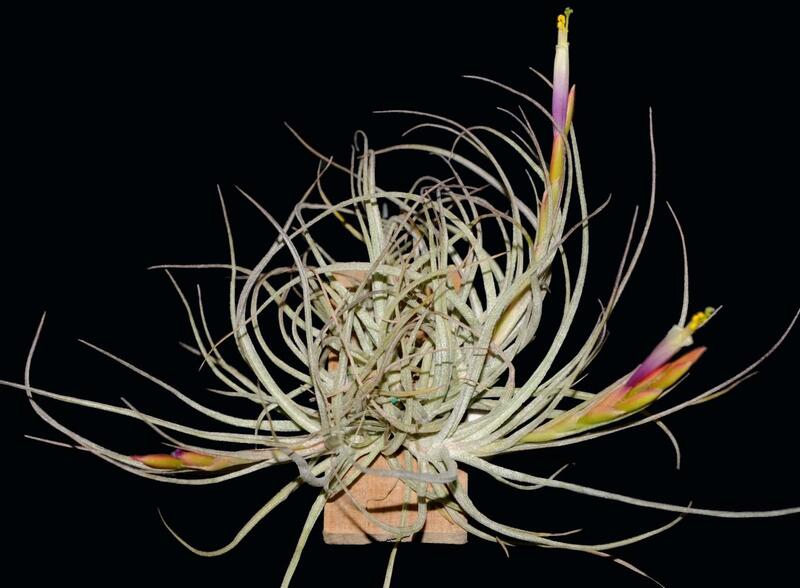 There is no denying that your plant is the same as that of Ken Woods. Ken raised the seedling from Pam Koide, but we know how easy it is for foreign pollen to do the job even when we might suspect that we could be dealing with a natural hybrid. In 1996 when in California I quizzed Pam about this species BEFORE it was published by Harry and was able to get an offset. This has since grown and flowered somewhat reluctantly and offsetted and seems to agree with the description. This assumption is confirmed by the photo by Ken Marks who comes from Florida. Clearly Ken Wood's plant (and yours) has had something added not only in flower but in plant shape. Note also the lack of trichomes on the floral bracts on your specimen. Remember that T. schiedeana is also known for its glabrous (no trichomes) bracts but there is no proof of paternity! At the moment I have the feeling that the clone you and Ken have should have a name rather than "the wrong T. occulta". Because of its offsetting habit I can see it spreading far and wide. 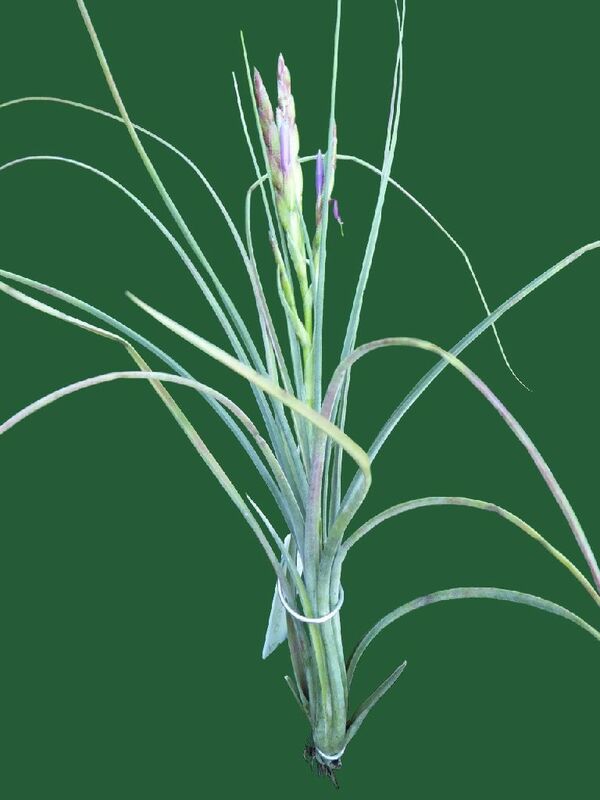 So how about giving it a cultivar name and how about something to do with occult such as Witch or Warlock! In the meantime perhaps Ian can post this extra info of mine on his site in case other viewers get a brainwave. By the way, this second thought of mine was triggered by Renate Ehlers who tells me that T. occulta is behaving badly in Germany! May I suggest the name 'Taurus' ? Firstly 'Taurus' sounds a bit like 'Terence', who spotted the inconsistencies. Photographs and botanical description of the real T. occulata follows, thanks to Derek and fcbs. TYPE: MEXICO Sinaloa: along a logging road NE of Panuco, 1100 m. elev. along a small stream, epiphytic on Bombaceae in a pine/oak forest with Tillandsia caput-medusae, T. makoyana and T. pseudosetacea, 6 March 1993, Luther, Schuster, Baker, High & Quick 2950A (Holotype: SEL; Isotype: MEXICO. 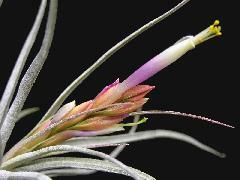 A. Tillandsia simulata. Small, cui similis, bracteis florigeris majoribus sparse lepidotisque et sepalis majoribus differt. Plants growing in small clusters or single, flowering 18-40 cm tall. Leaves erect to spreading, twelve to twenty-five in number, 15-32 cm long, somewhat succulent, densely cinereous-lepidote, grey-green or tinged reddish. Leaf sheaths elliptic, 3-5 x 1-2 cm, inflated and forming an elongate pseudobulb, densely ferru-ginous-lepidote especially adaxially. Leaf blades very narrowly triangular to linear, attenuate, 2-5 mm wide, inconspicuously ribbed, involute, the apex subulate. Scape erect, 12-20 cm x 2-3 mm, nearly glabrous, green. Scape bracts subfoliaceous, erect, imbricate, densely cinereous-lepidote, grey-green tinged reddish. Inflorescence digitate with two to six branches, 4-10 cm long. Primary bracts elliptic, acute to attenuate, much shorter than the branches, cinereous-lepidote, grey-green tinged red. Branches erect to spreading, 4-8 cm x 7-11 mm, with one to three sterile basal bracts. Floral bracts elliptic, acute, 17-23 x 8-10 mm, thin coriaceous, somewhat carinate toward the apex, nerved, sparsely pale-lepidote both adaxially and abaxially, imbricate when fresh, slightly spreading when dried, green or tinged red or purple. Flowers subsessile, erect, opening in the morning. Sepals elliptic, acute, 16-20 mm long, the adaxial pair carinate and 8-10 mm connate at the base, thin-coriaceous, slightly nerved, glabrous, green. Corolla tubular, exceeded by the stamens and style. Petals ligulate, broadly acute, 33-38 mm long, unappendaged, purple. Stamens in two unequal series of three, the filaments flattened, purple, the anthers bright yellow. Stigma white. Capsules slenderly cylindric, 3 cm long. A collection of Dr. Werner Rauh (Rauh RM-15855 at US) and also cultivated by Renate Ehlers of Stuttgart, Germany is very similar although somewhat smaller. This was collected in 1968 near Acapulco but the plants have not been relocated (Ehlers, pers. comm., 1993) from this area. 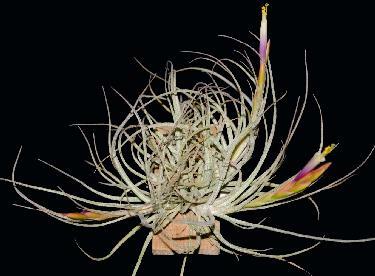 This collection was misidentified as Tillandsia ortgiesiana E. Morr. ex Mez, a poorly known species originally collected somewhere in Mexico by Benedikt Roezl in 1873. Tillandsia ortgiesiana differs from T. occulta by having less conspicuous subtriangular leaf sheaths and nearly glabrous floral bracts; it is very similar to T. hammeri Rauh in many features and may be conspecific. 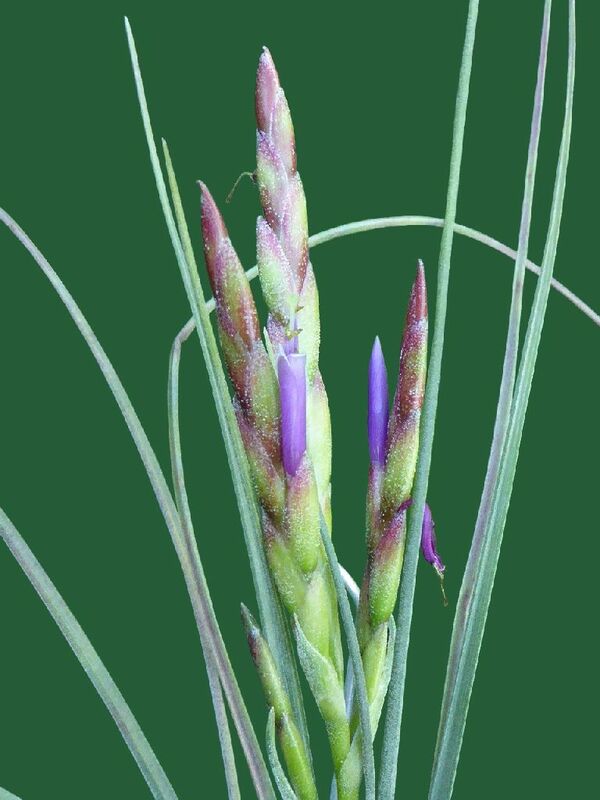 Tillandsia occulta seems most similar to the Florida endemic T. simulata but differs from it by having less densely lepidote, longer floral bracts (17-23 mm vs 14-18 mm) and longer sepals (16-20 mm vs 13-16 mm). In addition, the Florida plant has bright-colored, pink floral bracts in contrast to the mostly green floral bracts of T. occulta. 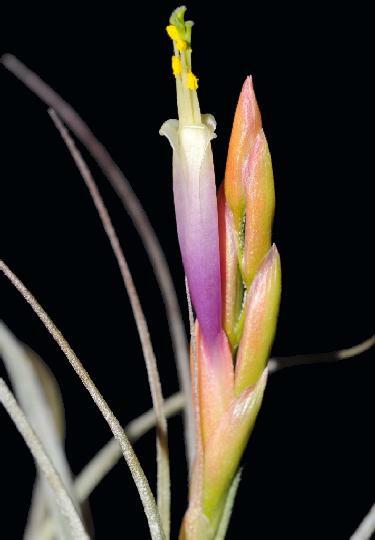 Tillandsia simulata was "lost" for many years, incorrectly treated as a synonym of T. bartramii Elliot. A case could probably be made to relate T. occulta to T. baileyi Rose ex Small of NE Mexico and SE Texas. They share a somewhat pseudobulbous habit, lepidote floral bracts and a very similar floral morphology. I suspect that all of these taxa, and possibly T. exserta L.B.Smith and T. elizabethiae Rauh in addition, represent disjunct relic derivatives of a circum-Gulf of Mexico Tillandsia taxon that had its range fragmented by climate change. 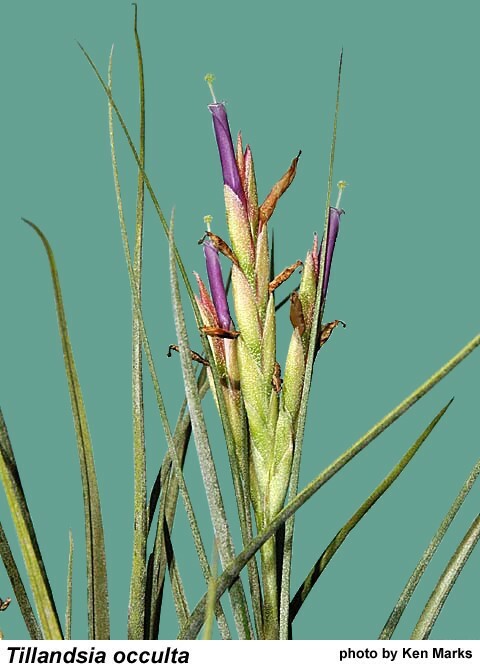 The specific epithet of this tillandsia is based on the fact that it was "unseen" or "hidden" by being misidentified as T. ortgiesiana.